SO MUCH YARN, SO LITTLE TIME! : The good the bad and the ugly. The good the bad and the ugly. Life has been gettting the in way of blogging lately...but I have a few moments to tell you about the latest sample knit for Shall We Knit! So this is the good. Yarn: Dawn 2 ply in lime green, 3 balls for the sweater and the hat in the premie size. It is the cutest little baby sweater! 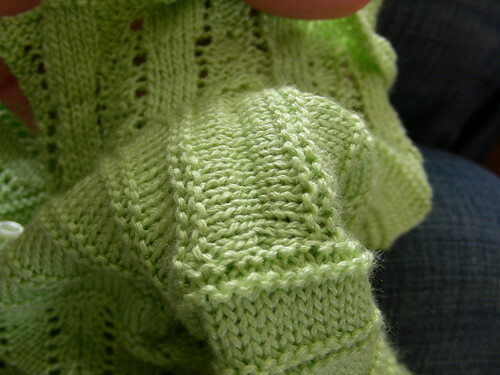 The pattern is fairly simple with a little lace detailing. 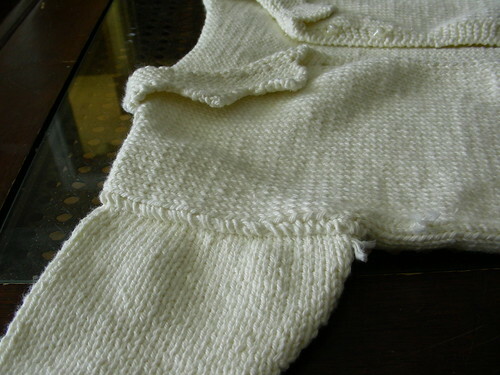 I must confess that I am a fan of seaming. I love putting the pieces together as flawlessly as possible. Now, I am no professional. I have learned through experience and some on line and book reading. I wouldn't normally knit a hat flat, especially a baby hat. But, being a store sample I knit it as written. I would suggest knitting it in the round...it is bad enough some babies get a flat spot on the back of their heads from lying on their backs...could you imagine that with a seam line!?! So here is the bad and the ugly. This was knit, by me, about 6 years ago. I don't know why I have saved it. It was never worn, thankfully, because Matteo came out as a boy! I really had no idea about gauge...look at how wide it is! And the seaming up is horrible. Oh, it is so bad. But I took photos of it to show you my progression as a knitwear seamer! Look at this underarm seam...what was I doing?!? Thank goodness for learning mattress stitch! 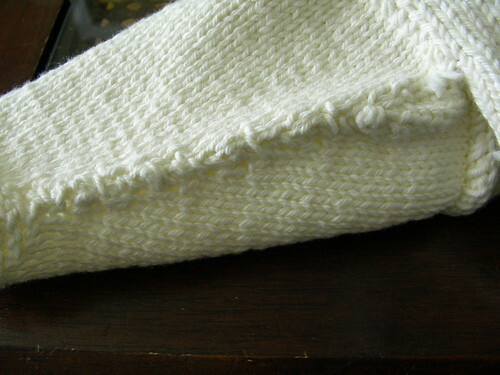 For those of you who are still in the beginning stages of learning how to seam and finish off your knits (I don't think I will ever stop learning)...there is hope! Fun to see the comparison of an earlier knit and one where you have some experience. 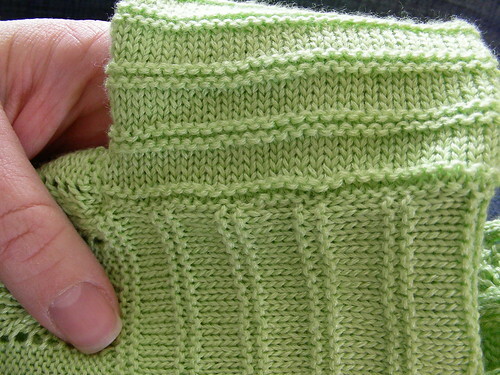 Your seaming now is beautiful! And the little lacy sweater and hat are beautiful too. Was that the whip stitch on the white sweater? I made a sweater for my nephew and whip stitched it together and I hated how it turned out. Never again! I will be using mattress stitch next time! Mattress stitch? Indeed, it looks great. You give some advice on mattress stitch please? What a wonderful comparison. Soemtimes, we think we aren't learning still, but indeed we are. 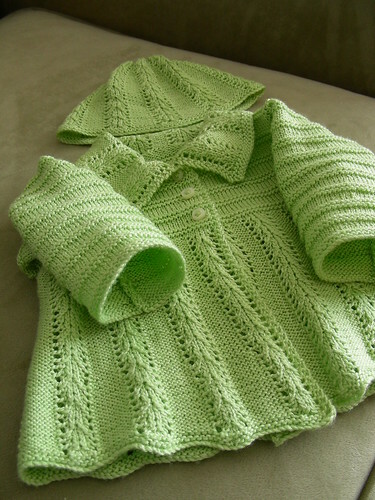 That little apple green baby sweater is gorgeous. Is that pattern for sale? I live in dread of seaming...this gives me hope! I adore the lime green sweater -- gorgeous! haha, that looks very familiar! Mattress stitch was such a revelation - like learning to read - big light bulb moment! Will you go back and reseam the white sweater? g uThat green sweater is so beautiful! 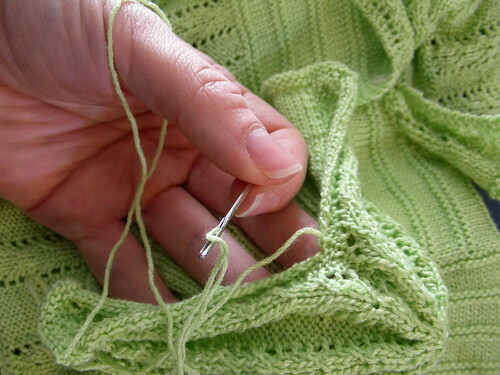 I can definitely relate--when I was growing up and my mom taught me to knit, she didn't put anything together herself--she had a woman at her LYS who finished garments for $5! So when I grew up, I tried and tried, took 2 classes, and finally think I am at the place where I can do a pretty nice mattress stitch! It does take practice but can be very gratifying. I'm glad I learned. Isn't green such a wonderful colour? The sweater and hat are gorgeous. It's wonderful to see the learning curve and progress made up close and personal. The green hat and sweater set are lovely. I used to whip-stitch-seam everything too until I learned how to do mattress stitch. 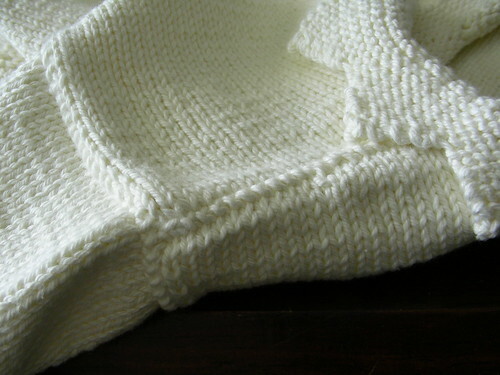 It's great that you kept the previous sweater to see how much your knitting has evolved! I love all of the things you knit!!! Oh, I'm having sympathy pains just looking at the white sweater - I think we've all been there! The green set is lovely; the beautiful seams are the icing on the cake. Wow! Okay, you have definitely made progress since then! That baby set is too cute. I don't dread seaming, but it sure does take me a long time to get it "just right". That white sweater is pretty adorable tho - all flaws aside. Beautiful green set too. 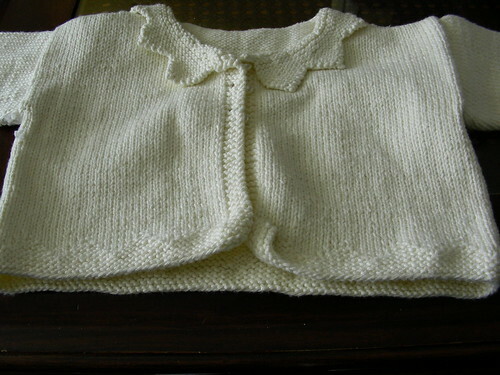 I was at Shall We Knit on Fri. and saw the baby outfit in person. It's adorable and you did a fantastic job. I don't have any babies to knit for but I was tempted anyway. Great yarn shop, though not so local for me. I kept a lot of early stuff, and I posted a series on my blog "Timeless Tuesday" where each week I featured a different item and what i learned. I'm not sure why I had a hard time at first with finishing--I had absolutely no trouble with getting books for the patterns from the library, but never checked out the finishing parts! What a beautiful lime green set. SO cute. I'm still afraid of seaming, though. I have those moments as well. I keep wanting to rip back some of those earlier projects!